to be other than under the scorching sun. That wasn't the case for Teunis Schuurman. in Lansdale and will end at the home of relatives in London, Ontario, and then with friends near Green Bay, Wis.
Schuurman paused briefly Monday morning to check a map along Route 61 on the Saint Clair-Frackville grade. He began Monday's journey in Kutztown and planned to travel as far as Frackville. "Right now, I'm working on riding 50 or more miles a day," Schuurman said. He was expected to depart from Frackville this morning en route to Danville, before eventually making his way to Wellsboro, where he will spend tonight. The next few days will have him riding to Niagara Falls and then into London, where will stay with his relatives. and begin the final leg of the journey to Sherwood, Wis., just outside Green Bay. Monday morning, Schuurman had a pleasant surprise in nearby Berks County. "I stopped to eat in this place called Hamburg and a man there bought me breakfast," he said. This is the reaction the cyclist has so far encountered on his journey. "People have been very nice to me," he said. "I can't say I have met anyone who has acted differently." From the time he started, Schuurman estimated he will be in London, Ontario, in about nine to 10 days. That distance is about 700 kilometers - or about 450 miles - from Lansdale. from where he will fly to Detroit, then New York City and home to The Netherlands. 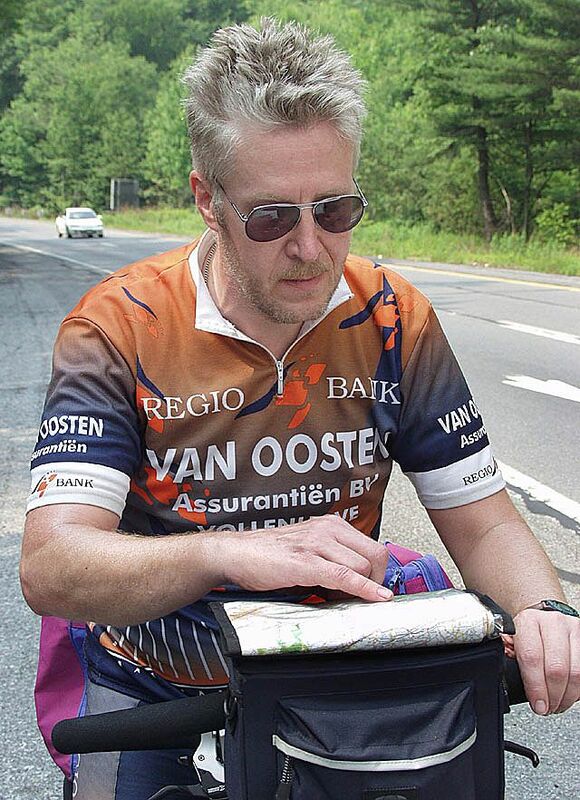 Schuurman said he decided to trek through the United States and Canada because he loves to travel and bike. on what he refers to as his "Iron Horses." Schuurman is no stranger to America. He said this visit is his 29th trip across the sea. "The next one will be a reason to celebrate," he joked. America has become the European rider's second country in the past 20 years. He has visited 41 of the 50 states - a feat few Americans can say they have accomplished. and take on endeavors such as this 900-mile trek. Having the ambition and drive to pedal such a distance is one of the main requirements to complete the journey, he said. "When people ask me how I'm doing, I say, I'm fine.' No car, no woman, no mortgage. Granny's is a charming, family-owner motel with 30 wel-appointed rooms and two suites.